Oh. my. gosh. 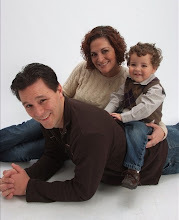 I have little excuse for the lapse of time since the last blog entry, but that won't stop me from listing a couple before diving into baby fun. Kevin and I moved in early July and that made life a little insane.... Okay, a lot insane. After that, we found out that our beloved crashed computer was a ruined computer. Yep, completely fried. Many weeks and a new Toshiba later and we're back in business. 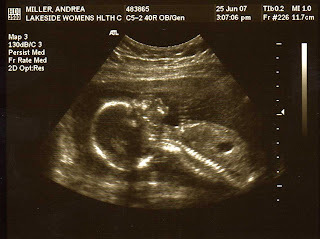 I VOW to be a better mom-to-be blogger and can only hope there are still a few people out there checking for updates. With that said, on to business! 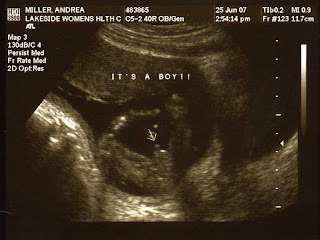 I was finally reunited with my scanner and now I can share the pictures of my adorable boy on the day we found out his gender. Here are a couple of side profile shots. 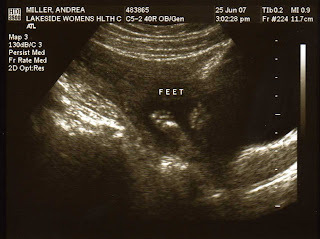 Here are his little feet crossed at the ankles. You are looking at the bottom of his feet. Look at those toes! Other news? His name! We've decided to name him Riley. (Yes, we love Keith and Natasha that much!) I never realized how hard boy names were until we tried to decide on one! Riley was one of the few names we actually agreed on and somehow, it just stuck. Little Riley-Roo is just kicking like crazy at all hours of the day and night. I can't complain though. It's pretty much the best feeling ever. All I do is think about him and what he must look like and what kind of personality he will have. So far, he has a wiggly personality. We're over halfway through this journey and it blows my mind! I'm at 23 weeks, 2 days! 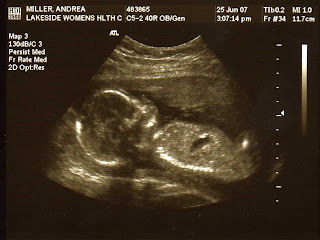 Hey Andrea, congrats! Your little bump is so cute! i've been waiting for a new post! i'm sure little riley is going to be adorable! Lovey the name. 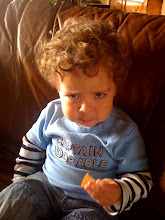 Boys are so much fun, but they don't have as wide of a selection of cute clothes! A look at wiggly Riley! Does this baby make my belly look big?? ?